Here are some questions that I get asked most often. If there is still something on your mind that is not covered here, please contact me. 1) I really want to learn how to crochet. Where should I begin? I am so happy to hear you want to learn how to crochet! There are many free resources on-line that can help you begin your own crochet journey. For starters, you can check out my Crochet Lessons serials where I cover almost all of the crochet basic. And the lessons will keep coming in the future too. Subscribe to my blog and make sure you don’t miss something new and exciting that could help you with crocheting in the future. 2) I saw a ton of nice patterns on your web side. Which of your patterns do you recommend for beginners? I would recommend my “So Fluffy” for beginners as it uses very basic stitches, the pattern is a photo tutorial and it’s quick and fun project, using very soft super bulky yarn. Be aware that crocheting baby booties are not the easiest crochet item you could begin with, especially because you need two identical items. But hey, you should try it anyway! Failing is the part of the learning process too, right? My first pair of crochet baby booties was a total disaster. Maybe someday, I will share some pictures with you guys. 3) Where do you buy your yarn? What type of yarn do you use for your projects? When I first started crocheting, I was so confused about yarn. I was choosing the yarn by appearance. And after hours and hours of work, when my item was finished, it was not the right size, or stitches were too tight and the item was not so soft. Now, years after, I buy most of my yarn online, from different websites. I prefer to use 100% cotton yarn. DK weight. It’s easy to use. Cotton is strong wet and dry there is no special care needed when washing it. It is perfect for baby clothes. Almost all of my patterns are made of cotton yarn. It shows the texture of stitches patterns clearly, perfect for my photo tutorials and it’s great for beginners too. I also love, love Baby Merino or Extra Fine Merino yarns. They are super soft and just best choice for a baby garment. You can read more about yarn HERE. 4) What crochet hooks do you use? I use aluminum crochet hooks. Most of the time size 3.25 mm for baby booties and 4 mm for almost everything else. I always wanted nice wooden crochet hooks. Since I got them I have to be honest with you guys, I use them just for my photos. Somehow I like my aluminum crochet hooks more. But I believe that my perfect wooden crochet hook is still somewhere out there. 5) Do you sell your crocheted creations? No, I am sorry, I don’t. I have shops on Etsy, Ravelry and Craftsy, where I sell my premium patterns. The main reason for not selling finished items is an enormous shipping cost from my country. But I thank you for your interest! My main focus is on creating new patterns as I love creating something new each time I take a crochet hook and some yarn in my hands. I know that I would not be able to devote as much time to my patterns if I would sell my final items too. 6) Can I sell the products that I make using your patterns? Please read more about selling products made using Croby patterns HERE. Generally, I would appreciate it if you did not sell projects made using my FREE patterns. But if you do, please create one or two additional projects and give them to charity. There are so many children in this world that need help. I hope I do not ask too much! 7) What is a difference between 3 hdc and hdc 3? If the number is written in front of the stitch – 3 hdc = work 3 hdc into the same stitch. If the number is written after the stitch – hdc 3 = work hdc into next 3 stitches. 8) I have a hard time with understanding one of your patterns! Can you please help me? First and foremost, read the whole post first. Most of the time the answer is written in post introductions part. Read all the instructions carefully. Couldn’t find the answer on your question? … Let me know that you need help, I am always happy to help! 9) Can you please make a video for your project since I’m more of a visual learner? I have a YouTube channel where you can find my video tutorials. 10) Can I link to your work in my blog or round-up? You are always welcome. I would love to know about these features, so please let me know if you are doing so. You can use one of my photos and please link back to my original blog post. Just do not copy my patterns or post them as your own. 11) Do you take requests? I am always happy to hear what you would like to see on my blog. But I cannot promise I can please all of your requests. Hope you understand. 12) Do you have any tips on blogging, photography or creating and selling patterns? I am trying to put together a blog post with my personal tips about all of these topics that I gathered during my crochet journey. Thanks for your patience! 13) Are your crochet patterns written in US or UK terms? 14) What camera do you use to take your photos? I use my Nikon D3100 and my Nikkor 1.8, 50 mm lens. 15) What program do you use to edit your photos and create your patterns? I use Adobe Photoshop for my photos and Adobe InDesign to design my pdf patterns. 16) What made you start this blog? I would say for myself that I am a very creative person. I love creating something new and exciting and writing a creative blog is a great way to share my crochet journey. 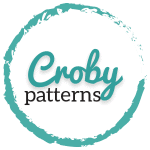 17) Why did you name your blog Croby Patterns? The name Croby is a shortening for Crochet Baby. 18) I want to make one of your items bigger. How can I do that? The easiest way is to use a larger crochet hook and a thicker yarn than the one specified in the pattern. Crochet one sole, then check if the final size of the sole is the size you want. If yes, continue on the upper part. If no, use an even larger hook and a thicker yarn. You can read more about it HERE . Sometimes changing the size of the final item can demand changes in the pattern. In this case, you have to rewrite the pattern and adjust it for bigger sizes. 19) Is there possible to get any of your free patterns as free printable pdf files? No, I am sorry. You can come back and find patterns here at any time you like. If you are interested in buying free patterns as a pdf file, please let me know and I will create a custom order on Etsy for you. 20) Can I translate the pattern and share it on my blog? I am very happy to hear you are interested in my pattern so much that you would like to translate it. You can translate the pattern for your personal use only, but you can not translate the pattern and publish it on your blog/page even if you share the link to the original page and make your own photos of the final item. Thank you for respecting me as a designer! I’m back! I just read through your faq’s and may have found an answer. I would appreciate it if you could produce a pdf pattern for the ugg inspired bootie pattern. I have no problem paying for this. I have tried several times to figure out how to download the program and I just can’t get beyond the scan part. I fell in love with your patterns and am planning on having fun with them so thank you so much! Hi Roxanne! You can find the PDF pattern for UGG Inspired Baby Booties here: https://goo.gl/BVfRfa Happy crocheting! Hola me encanta todo lo q haces, me acabo de suscribir a tu canal, pero tengo un problema q está en inglés. No traduces los vídeos al español?